Addressing about 100 people standing outside the White House March 28, Beatriz Mejia, a native of El Salvador, called on the United States to recognize that the thousands of mothers and children like her who have fled Central America in search of safety pose no threat to America. "We have come here from an unjust situation," said Mejia, the mother of a 7-year-old son, who spent months in one of the family detention centers open since mid-2014 in the Southwest U.S. but now lives in the Washington area awaiting a hearing on her case. "Many of us have lost our loved ones because of the violence we are experiencing." She said through an interpreter that she was the victim of an attempted murder in her homeland and the incident caused her to flee northward. "We are here to seek opportunities in this country and we are not a threat," she said of the families who have seen family members and friends beaten or killed as Central America experiences periodic waves of violence. Mejia's testimony came at a rally planned by the CARA Family Detention Pro Bono Representation and Advocacy Project as President Barack Obama hosted the annual White House Easter Egg Roll for hundreds of children. Rally organizers said they chose the day and the site to highlight how children being held in the detention centers did not have the freedom to participate in any Easter celebration. Several speakers called on Obama and Congress to close the detention centers, alter policies in order to keep families together and to enact comprehensive immigration reform for the estimated 12 million immigrants living in the U.S. illegally. "There are children here (in detention) who would like to be there," Sister Eileen Campbell, a member of the Sisters of Mercy of the Americas, told Catholic News Service as she pointed to the White House. "It's a human rights issue, not a terrorist issue. If we are as good as we say, we ought to be sharing. If we're this country with great resources, the greatest security, I don't think we should be afraid of women and children." The group included several people holding posters and signs calling on the White House and Congress to end the practice of detaining families for weeks or months until they are processed. Some of the signs had images of immigrant children who had been held in the detention centers. The centers opened in 2014 in response to waves of immigrants, many of them unaccompanied children, from throughout Central America who made their way to the U.S. border and were discovered state or federal authorities. Five baskets of brightly colored plastic Easter eggs were placed on the ground in front of the sign holders. In addressing the gathering, Sister Eileen said she wanted to let the detained families to know that women religious throughout the country stood with them and were joining the call for new policies in how the country handles immigrant families. She called the detention of families "immoral and unjust." Attorney Isabel Saavedra worked with the CARA project from July through November in the 2,400-bed South Texas Residential Center in Dilley, Texas, and now works for the Archdiocese of Washington, helping families who have been released and have relocated. She said she found people living in "inhumane conditions" including a lack of adequate health care and facilities that were too cold for people accustomed to warmer temperatures. Housing children in what amounts to prison is not sound policy, Saavedra said. 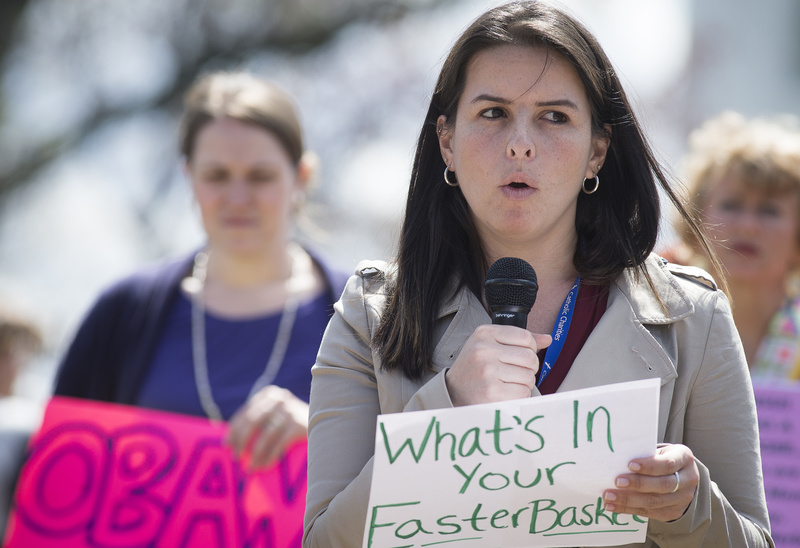 "Family detention is not the answer or how we should be treating refugees," she said. Other speakers called for a policy that upholds human dignity and provides adequate shelter, food, education, health care and other services to the immigrants who have fled traumatic settings. The CARA Family Detention Pro Bono Representation and Advocacy Project was formed a year ago by the Catholic Legal Immigration Network, American Immigration Council, Refugee and Immigrant Center for Education and Legal Services, and American Immigration Lawyers Association in response to Immigration and Custom Enforcement's expansion of family detention and the opening of three facilities to detain women and children in New Mexico and Texas. It provides no-cost legal service to detained families and advocates for the end of family detention legislatively and in the courts.